SallyB2 Where shall they wander? Londonist has had an astonishing flash of brilliance this weekend. It may not fundamentally improve the fabric of society, or save the planet. But it so neatly wraps up a number of pressing issues. We’re so chuffed we’re going to have an extra tofu muffin with our brunch. We’ve just been reading about these problem fowl in Chesham and the fact that they need to be relocated. And then there was all that kerfuffle about sonic teenager repellants v. human rights this week. You see where we’re going with this don’t you? It’s obvious, isn’t it? We bet you’re kicking yourself now that you didn’t see it first. Yup, we reckon that we should retrain and redeploy the geese around London as teenager deterrents. In fact, our friend the shopkeeper can see huge potential. We can already see ADT and Group 4 buying into our idea. OK, ganders may be a bit messy, but they must be so much cheaper to run than bouncers and alarms. 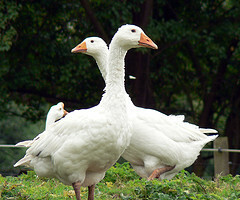 Furthermore, if geese were good enough for Juno on her Capitoline they must surely be good for guarding our Ken ‘n’ all. Photoshop genii where are you when Londonist needs you? Piccie courtesy of Claude CF's flickr photo stream.